The countdown is on for the best line-up of shortlisted international teams in many years about to contest the 25th anniversary Harken International Youth Match Racing Championship on Pittwater over November 22-26, 2017. 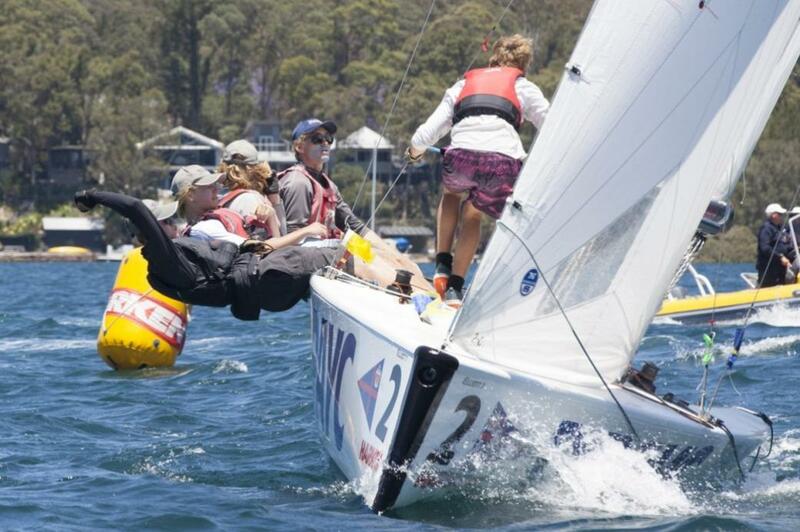 ‘The Harken’, as it’s best-known, is one of only two top-tier Australian youth events that offer prizemoney. The other stipulates the prize be taken as a travel grant whereas Harken Australia offers the winning teams $1000 cold-hard no-strings-attached cash for first place, $750 for second and $250 for third. Not only is 2017 the regatta’s notable silver anniversary, it also marks 20 continuous years of Harken’s naming rights sponsorship, which is considered a milestone in the sport. Entry is based on rankings and from 30 team applications The Royal Prince Alfred Yacht Club has whittled the number down to the maximum 12 teams. 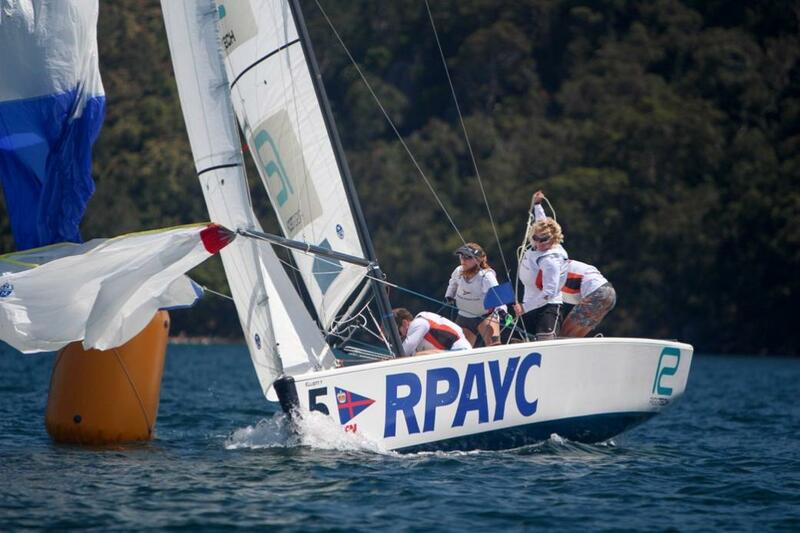 The Royal Sydney Yacht Squadron, Cruising Yacht Club of Australia, Royal New Zealand Yacht Squadron and Royal Perth Yacht Club are fielding an U23 squad as part of a longstanding agreement between the clubs to support each other’s youth programs. A Japanese team made selection, one of the few times the island nation has been represented in the event’s 24 year history. Called Pacific Racing Team, skipper Leonard Takahashi has a world match racing ranking of 43 reflecting his recent podium finishes at the New Zealand National Championships and 2017 Governor’s Cup. Takahashi also campaigns a 49er skiff. Top ranked skipper Jelmer Van Beek is representing The Netherlands with his Team Dutch Wave. Currently ranked 42nd in the ISAF Open Match Racing Rankings, the team has been busy contesting various match racing and keelboat events across Europe. Sarah Parker from the host Royal Prince Alfred Yacht Club’s Youth Development program, one of two women skippering the RPAYC’s Elliott 7s, is returning to defend last year’s podium finish. Parker is hungry and match fit having just returned from South Korea’s Busan Cup where she placed eighth against the world’s best female match racers. The RSYS team features helm Charlotte Griffin, who made her match racing debut at this year’s Marinassess Women’s Match Racing Regatta, and a mix of new and experienced sailors. Two American yacht clubs, Balboa and the Chicago Yacht Club, plus New Caledonia’s Cercle Nautique Calédonien are sending Harken International debutants. RPAYC head coach Tom Spithill said: “It’s the best line up in terms of represented countries I’ve seen for a long time and indicates the regatta’s standing among the youth match racing scene that teams would travel from as far away as Chicago and The Netherlands. “With six of the 12 teams ranked within the world top 150 and four remaining competitors in the top 300, competition for this year’s Rockin’ Robin perpetual trophy will be fierce,” he added. Very different to fleet racing, match racing is a complicated and super strenuous form of boat-on-boat round robin competition where pairs try to outfox each other and force penalties to gain the advantage, all watched by on-water umpires of the highest calibre with flags and whistles at the ready. Chief umpire Ben Fels from the Mornington Peninsula in Victoria is one of three international umpires and part of the Harken International 2017’s judging team of eight. The Harken International Youth Match Racing Championship has served as a launch pad for a number of yachting’s stars including dual America’s Cup winning skipper James Spithill, Michael Dunstan, William Tiller, Chris Steel and Torvar Mirsky, who skippered the triumphant West Australian team at the China Cup final of the World Match Racing Tour last month. Wednesday November 22 is a dedicated practice day and the competition begins in earnest on Thursday through to Sunday, starting at 1000hrs daily. The long range forecast indicates nor’easters building reliably to 15 knots by the afternoon across the four days. Harken invites all youth sailors to join its free fan club called Harken Blockheads www.harkenblockheads.com which aims to develop content, mostly video, that teaches youth sailors important concepts such as rigging, tuning, maintenance, repair and other race preparation concepts specifically linked to the physical boat. Day 1 of the HARKEN International Youth Match Racing Championships has kicked off with blue skies and a building nor-easterly wind, perfect conditions for the 25th anniversary of the prestigious event. Head race officer Ted Anderson powered through today’s racing, getting 10 flights (40 races) completed and making the most of the fantastic conditions. The high caliber of this year’s competitors has led to tight racing with skippers currently in close contention for the lead. New Zealand skipper James Wilson from the RNZYS is currently sitting in first place with 7 wins and 1 loss. He is closely followed by Japanese skipper Leonard Takahashi on 6 wins, 1 loss and the Cruising Yacht Club of Australia’s skipper Finn Tapper on 5 wins, 1 loss. Last evening, at the official opening ceremony, Australian Sailing Coach of the Year Thomas Spithill got an insight into each team’s strategies and goals for the week ahead. Pacific Racing Team skipper Leonard Takahashi from Japan mentioned that he and his team are keen to take the title home, backed by hours of on the water not only in the RNZYS fleet of Elliott 7’s but fleet racing his 49er internationally. Highest ranked skipper Jelmer Van Beek of Team Dutch Wave compared his experience on the European Match Racing Circuit to his expectations for the HARKEN, noting that ‘everyone is in it to win it’. Today, teams certainly proved Van Beek’s expectations true, hungry for the Rockin’ Robin and accompanying prize money. With the forecast for tomorrow looking similar to today’s building nor easterly there is hope to complete the round robin and move onto the quarter finals by the weekend. After another day of perfect match racing conditions, the round robin has been completed and our top 8 quarter finalists for the 25th Harken International Youth Match Racing Regatta have been determined. Race Officer Ted Anderson has made the most of the building north easterly breeze to complete the round robin and start the quarter finals ahead of the weekend. 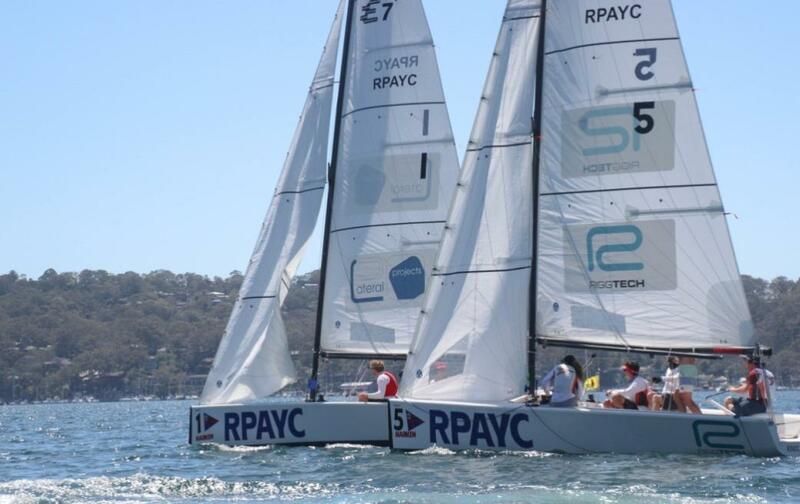 Today’s racing saw a jump in competitor confidence and boat handling skills as teams settle in to the RPAYC’s fleet of Elliott 7’s and breeze patterns typical for sailing on Pittwater, often unpredictable. First placed skipper Leonard Takahashi and his Pacific Racing Team from Japan had a strong round robin with 10 wins and 1 loss. Takahashi’s only loss was to second ranked skipper, Finn Tapper from the Cruising Yacht Club of Australia who has finished the round robin on 9 wins and 2 losses. Close behind Tapper in 3rd place is James Wilson from the Royal New Zealand Yacht Squadron’s Youth Training Program on 8 wins. RNZYS coach Reuben Corbett who is also coaching Takahashi and his Pacific Racing Team, commented “I hope both my teams finish on the podium this year, it’s great to see them on track at the end of the round robin”. Takahashi noted that he’s feeling confident going into the quarters against chosen skipper Callum Radford from the RPNYC, New Zealand. “We have had some beautiful racing in outstanding conditions. I myself put the team in some sticky situations but my team kept the boat going fast and we were always able to pull the opponent back, so full hats off to the boys for their help. We have a few things to work on, but for now, we’re happy and looking forward to the next few days ahead. Thanks to the RNZYS PP, looking forward to racing and finishing the job off”. With a similar forecast again for tomorrow it is likely that quarter finals will be completed with time for the semifinals and finals on Sunday. Places 9th to 12th will sail a consolation round robin, carrying points from stage one forward. In a first for a Japanese representative team, rising match racing talent Leonard Takahashi and his crew claimed the 25th anniversary 2017 Harken International Youth Match Racing Championship convincingly and in unique style on finals day, Sunday November 26, 2017. 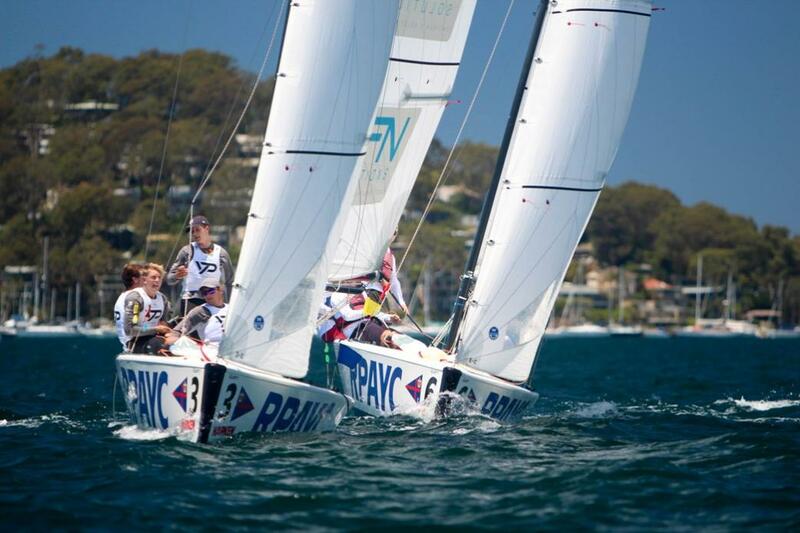 North-easterly sea breezes 14 gusting to 18 knots on Pittwater paired with bright spring sunshine capped off four days of similarly ideal conditions for the 12 competing teams, eight of them international. Over the four-day knockout round robin format Takahashi’s Pacific Racing Team and their training partners, James Wilson’s Royal New Zealand Yacht Squadron team, proved round after round they had the pace, flair and match racing nous to deserve a finals berth. The finals were definitely a balancing act for RNZYS coach Reuben Corbett who trains both teams, thereby requiring him to carefully divide his loyalty when two sets of protégés ended up squaring off. Overseen by race officer Ted Anderson and his highly polished race management and umpire teams, Pacific Racing Team wrapped up the series 3:1, then added their own unique and ummeditated post-match celebration. At the finish Takahashi was wrestled off the helm by Josh Wijohn and into the water. Then, in the excitement of their victory bowman Taylor Balogh repeated the celebration on Tim Snedden, leaving the Elliott 7 sailing downwind crew-less until the boat was recovered without incident. Similar to New Zealand’s Peter Burling and Blair Tuke, who went from Rio 2016 gold medal performances to helping secure the 2017 America’s Cup for Emirates Team New Zealand to the Volvo Ocean Race, the next tier of Kiwi youth match racers are shoring up the country’s sailing future, if the talent on display at the 25th anniversary Harken International is anything to go by. Though he lives in Auckland, should Takahashi move forward with his 49er skiff plans for Tokyo 2020 he is aiming to qualify for the host country, Japan. Second place at the 2017 Harken International Youth Match Racing Championship went to James Wilson, Sam Barnett, Zac Merton and Bradley McLaughlin (RNZYS) and third was Finn Tapper’s Cruising Yacht Club of Australia team of Tom and Jess Grimes, Harry West and Eric Sparkes. First, second and third place take home match racing points plus a bundle of cash each, thanks to the event’s naming rights sponsor of 20 years, Harken Australia. The Harken’s striking perpetual Rockin’ Robin trophy was originally donated to the RPAYC by Robyn Wiltshire-Newman. It is named after a boatload of young Australian men, including her husband and son plus other club members, who along with their boat Rockin’ Robin were tragically lost at sea back in 1990 en route to Fiji. Takahashi joins a long list of past Harken winners engraved on the trophy, some of whom have gone on to represent their countries and sailing at the highest levels. Starting Monday November 27 the Musto International Youth Match Racing Regatta fires up out of the Cruising Yacht Club of Australia with even higher ranked youth skippers (under 23) among the starting line-up, including fourth in the open world rankings, Harry Price, the pre-regatta favourite.